Jeremy Tan - "The Brains Behind Mango"
Jeremy is the brains behind Mango. Jeremy started working on Mango in 2004 and has since developed it to evolve with technology and the QHSE industry. 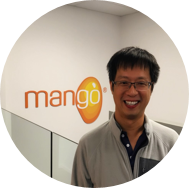 His development team drive the compliance industry in a positive direction to ensure Mango is a step above the rest. With the use of Jeremy's incredible coding skills and the skills of his team, together they provide you with the best possible user experience and a system that makes compliance management a breeze.